The Cinderella story of how the world’s greatest female gymnast leaped above a dysfunctional family right into the record books! 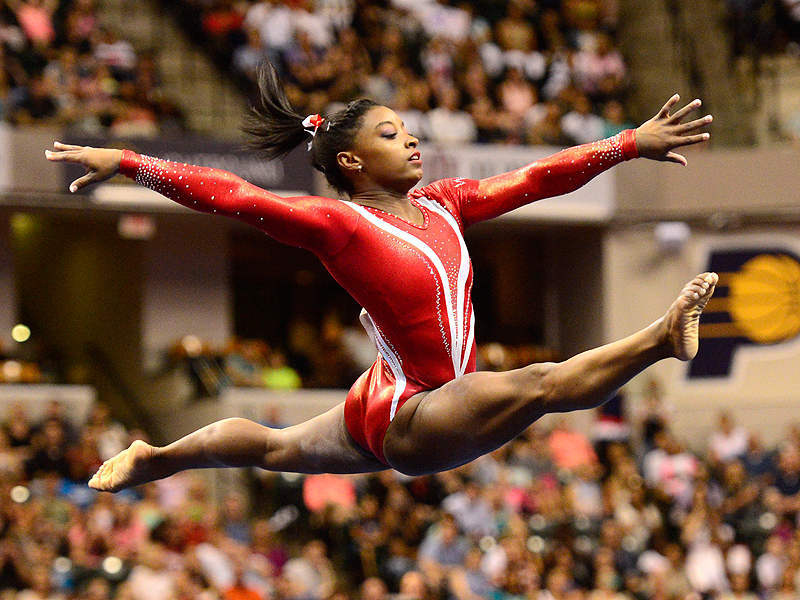 When Simone Biles launches herself into the air, millions watch with utter amazement and shock. Small but perfectly formidable, the 19-year-old American has already won so many gold medals that she is probably the greatest female gymnast ever. Its no news She dominated headlines alongside legends like Michael Phelps and Usain Bolt throughout the Rio Olympics. At least one viewer, however, will be watching with mixed emotions. At home in Columbus, Ohio, her biological mother Shanon insists she is immensely proud of her daughter, but there will surely be regret that Simone’s extraordinary success is something she has absolutely no claim on. In fact, if Simone had grown up anywhere near her mother, sporting history would be very different now. Instead, she was raised by her grandfather and step-grandmother, the ‘Pop’ and ‘Mom’ she blew kisses to in the stands during the Rio games. The ‘science’ of Biles’s incredible success is fascinating experts and fans, who hail the 4ft 8in wunderkind as a perfect combination of small size, huge strength and mind-boggling agility. But her history, say those close to her, is equally crucial to understanding her brilliance. Unlike many stars whose abilities are nurtured and encouraged by devoted, ambitious parents, Simone had bleak prospects at birth. She never knew her father, who abandoned the family years earlier, and knew her mother only barely. Shanon was an alcoholic and drug addict living in Columbus who was incapable of looking after her four young children. 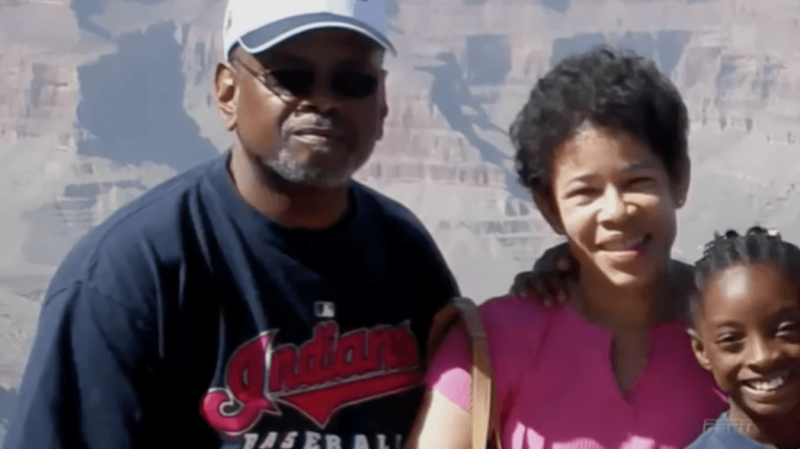 When Simone was three, she and her siblings went to live with her maternal grandfather, Ron Biles, his second wife Nellie and her two teenage sons from a previous marriage. The couple — who both came from poor backgrounds and had worked immensely hard to get ahead — had been looking forward to retirement as their boys left the nest. Taking on young children they hardly knew (Mr Biles had become estranged from his wayward daughter) was, they admit, a challenge — but not one they ever seriously considered evading. The social worker called and said the kids were in foster care,’ recalls Mr Biles, now 67. And so Simone and her siblings came to live with their grandfather in Spring, a suburb of Houston, Texas, for nearly two years. The arrangement was meant to be only temporary — their mother still had parental rights — and everyone hoped that she would soon beat her addiction problems. The children even went back to live with Shanon, but shortly afterwards a social worker called Ron and Nellie again, this time to say their grandchildren were up for adoption. Their mother, still hopelessly hooked on drugs, had been deemed unfit to care for them. It wasn’t an easy decision to take any of them back. Mrs Biles, 61, then working full time as a nurse, had reached breaking point trying to hold down a job and look after so many children. ‘I remember wanting to just really disappear from that family, because I was so stressed; everyone needed me,’ she says. However, the couple rose to the challenge. While Mr Biles, a retired air traffic controller, wanted to adopt the youngest child, 14-month-old Adria, it was his wife who insisted they also take in Simone — the second youngest — so the two girls could keep each other company. 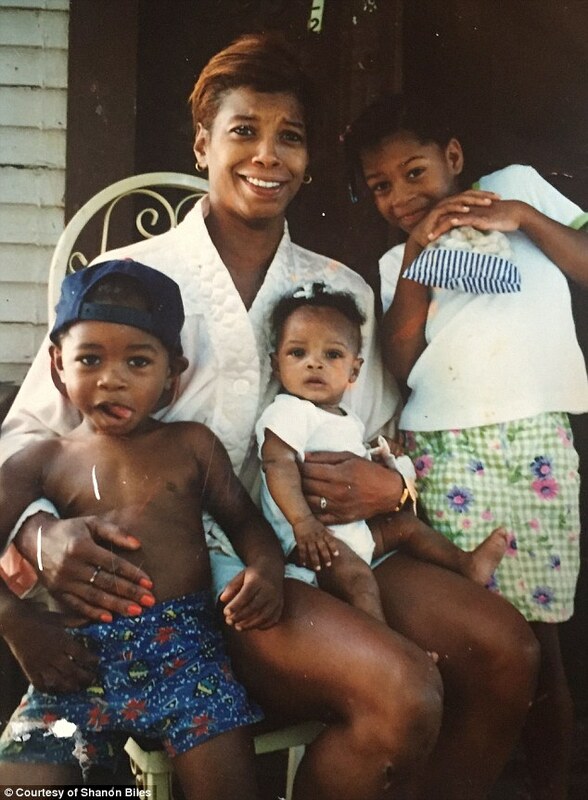 (Simone’s two older siblings went to live with Mr Biles’s sister). 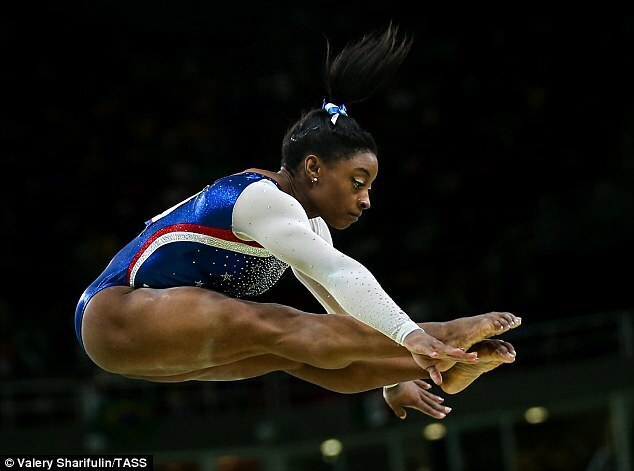 ‘Her mother had many problems with drugs or alcohol,’ Mr Biles has said of Simone. The two girls returned to Spring on Christmas Eve 2002, this time permanently. Mrs Biles says Simone had to be mentally strong from a very early age, saying she behaved like a ‘little mum’ in their home because her biological mother had never been able to look after them. ‘She made decisions for herself and her sister because this was all they knew,’ she explained. On the day their adoption became official, Mrs Biles told the children they might like to start calling them Mum and Dad. Simone spent the night in front of a mirror practising the two words she had barely used previously. As for Simone’s biological mother, Shanon, 44, admits she was furious at the time, accusing her father of ‘flipping a switch’ on her as soon as she signed the adoption papers to cut her off from her children. Aware she was still using drugs, he told her not to visit or even call them as they got used to their new family. ‘It took me six years before I saw my children again,’ she says. ‘It was hard to give up my kids, but I had to do what I had to. I wasn’t able to care for them. 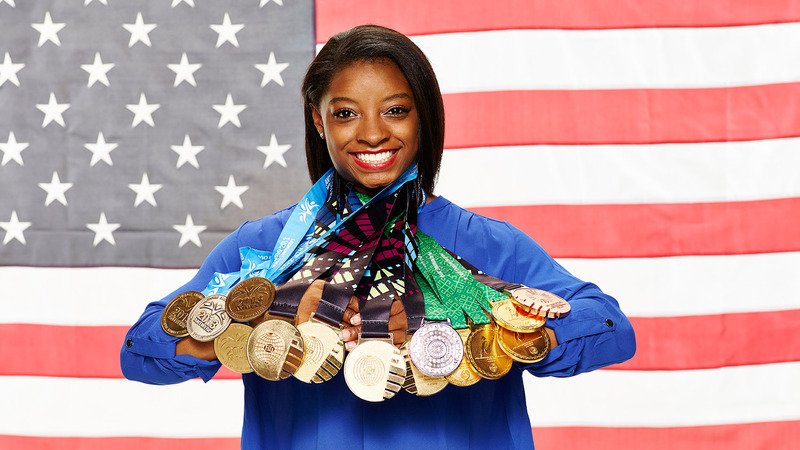 natural talent and inner drive have made Biles to become one of the top gymnasts in the world. The joyful, ever – smiling 19-year-old is the first woman to win three consecutive worlds all -around titles which have been followed by an impressive achievement of earning four gold medals and one bronze at the 2016 Olympic Games in Rio. 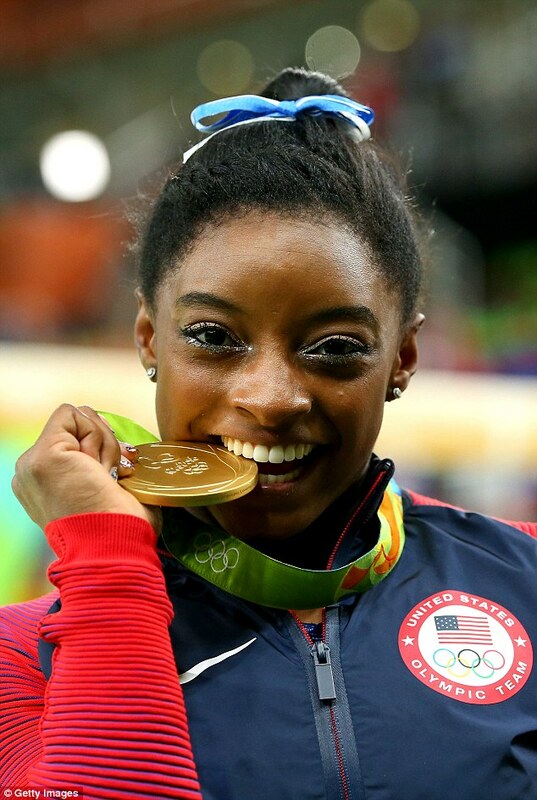 Biles is a three-time world all-around champion (2013–15), three-time world floor champion (2013–15), two-time world balance beam champion (2014, 2015), four-time United States national all-around champion (2013–16), and a member of the gold medal-winning American teams at the 2014 and 2015 World Artistic Gymnastics Championships. is known for her persistent , never-give-up spirit, her flaming passion and her determination. She said in an interview. “I want people to reach for their dreams. If you’re willing to put in a lot of work, and if you’re focused and determined, you can go really far. That doesn’t mean everything will happen overnight; for me, it took years of training and perseverance to reach my goals. But looking back on it now, I’m glad I didn’t give up. There so many people who have inspired me with their love and encouragement along the way — and I want to pass on that inspiration to readers,” said Biles. In Courage to Soar, Simone gives readers a never-before-seen look at her life. In her own words and photos, Simone reveals how challenges in her childhood have shaped her into the young woman and role model she is today. She shares the ups and downs of her life, insights into her positive mental approach, and her inspiring journey to the pinnacle of her sport. She also sets an example to always have fun, no matter the pressure. “Simone’s life and story will equip countless fans with the courage and motivation to move beyond ‘life as it seems.’ Her mega-watt smile and poise, not to mention dedicated demeanor. Simone still lives at home, goes to church with them most Sundays (the family are Roman Catholics), does chores and feeds the family’s four pet Alsatians. Although Mrs Biles admits Simone’s stubbornness can drive her to distraction, the pair have become inseparable. Simone says her mother’s soothing pep talks solved her early confidence problems. Wise words. Experts say Simone is so far ahead of competitors she has only herself to compete against. With her strong faith in God and her triumph against all odds, Simone is inspiring millions to dream big and follow their heart.